University student-run communications agencies allow students to work with real clients and get real world experience before they graduate from college and enter the workforce. Student-run agencies are increasing in popularity, but building a successful agency is challenging. With more than ten years of experience supervising a student-run agency, Swanson examines the three critical roles a student agency must fulfill in order to be successful. First, the agency must be an exceptional environment for learning. Second, it must be a successful business-without satisfied clients, the agency will not survive. Third, it must be a supportive partner in both on- and off-campus communities. 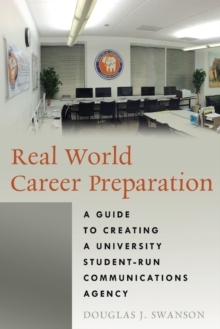 As the first book to address student-run agencies, Real World Career Preparation offers extensive `how to' guidance, and is supported by 22 Agency Spotlight best practice examples from student-run agencies across the U.S. The book ends with a comprehensive directory of 158 university student-run agencies in operation all over the world. 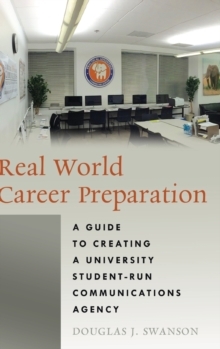 Real World Career Preparation is essential reading for any faculty member or administrator who is involved with an agency, or who plans to launch one in the future. This book is also valuable for college students working in an agency who seek `the big picture' view of how their work for clients has long-lasting impact on the campus and the community.